The Decommissioning of unused oil and gas infrastructures is a complex process undertaken after the asset’s ‘glory days,’ when ageing facilities can no longer justify their intended or current purpose. While some countries have been performing decommissioning for many decades, Malaysia is just beginning to see the need for a greater understanding for this procedure. With over 300 fixed offshore platforms in the country of which more than half are approaching the end of their intended service life, reality is starting to sink in that many of these platforms may have to be removed or dealt with in the near future. To date, only a handful of fixed offshore platforms in Malaysian waters have been decommissioned. 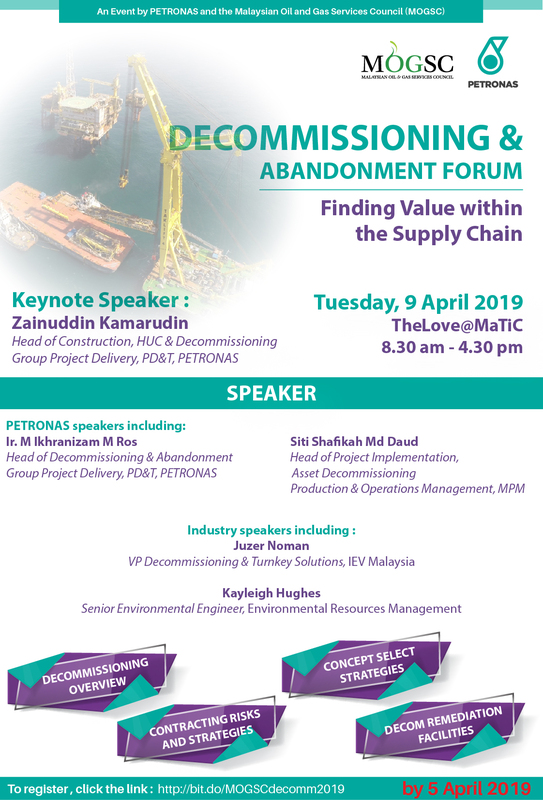 Join us for this special event on “Decommissioning & Abandonment Forum - Finding Value within the Supply Chain”, organised jointly by the Malaysian Oil & Gas Services Council (MOGSC) and PETRONAS.